Stacy Barton obituary. Carnes Funeral Home. STACY O’DANIEL BARTON AGE 44, PASSED AWAY ON WEDNESDAY SEPTEMBER 20, 2017, AT MEMORIAL HERMANN HOSPITAL. SHE WAS IN A TRAJIC MOTORCYCLE ACCIDENT. SHE WAS BORN IN HOUSTON, TX ON OCTOBER 18, 1972. SHE WORKED AS A WAITERESS FOR THE MAJORITY OF HER LIFE. SHE ENJOYED ARTS AND CRAFTS. SHE ALSO ENJOYED SKATING. SHE WILL BE REMEBERED FOR CARING AND KIND HEART. SHE ALWAYS WAS TRYING TO HELP SOMEONE IN NEED. SHE WAS VERY INDEPENDENT AND DID NOT ASK OTHERS FOR THEIR HELP. SHE WAS PREDECEASED BY HER BROTHER RUSSELL CONYERS. SHE IS SURVIVED BY HER PARENTS LINDA & JERRY CONYERS, AND HER FATHER PHILLIP O’DANIEL, GRANDPARENTS, CA AND JEAN ODANIEL. 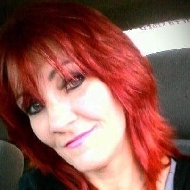 SHE HAS 5 CHILDREN MICHAEL JONES, COREY ESCOBAR, JOESEPH HALEY, MISTY HALEY, NICK PELTIER. SHE ALSO HAS 4 STEP CHILDREN TOMMY BARTON, JULIA BARTON, STERLING BARTON, TYLER BARTON AND THEIR FATHER CHAD BARTON. SHE HAS 2 GRANDCHILDREN CAYNDENCE ESCOBAR & ASHTON LEBLANC. SHE CAME FROM A LARGE FAMILY. SHE HAS 2 SISTERS, PAM CONYERS & AMI WHITE. SHE HAS 4 BROTHERS, CHRIS O’DANIEL, CASEY CONYERS, CURTIS CONYERS, & NEIL CONYERS, MANY LOVING NIECES AND NEPHEWS AND HER PRECIOUS DOG ABBY. SHE HAS MANY LOVING FAMILY MEMBERS AND FRIENDS. CELEBRATION OF LIFE WILL BE SATURDAY SEPTEMBER 30, 2017 AT FIRST ASSEMBLY OF GOD, 330 SHELDON ROAD, CHANNELVIEW, TEXAS 77530. VISITATION WILL BEGIN AT 11 AND SERVICE WILL START AT 12. PRECEDING THE SERVICES FELLOWSHIP WILL BE HELD AT CASEY & DAWN CONYERS, 16647 BEAR BAYOU DRIVE, CHANNELVIEW, TEXAS 77530.